We believe that this is a picture book. But it is a picture book with a story to tell. In symbols, characters, words and slogans. All contained within the individual trademarks. When arranged chronologically, they reflect the history, the values, the development and the nationalism that has gone into building an Australian heritage. Their authors are the forgotten individuals who commissioned them, and the unsung artists who created them. Although many of these marks may now seem flippant or trivial, there was a time when each one was thought about, discussed and paid for. Our notations merely enlarge their story by giving the reader a better perspective on the role and source of individual marks. Unfortunately, the real history of most trademarks is lost in the discarded guard books of printers and advertising agencies, or it is seldom recorded in corporate archives. In making our choice of visual material, we used a definition of a trademark that is, perhaps, wider than traditionally accepted. To us a trademark is any image, word, symbol, colour, emblem, coat of arms, shield, seal, signature, slogan, label, package, object, jingle, or personality which is presented and used consistently over a period of time so as to be recognised and associated with a product, service, manufacturer, organisation, or person. The material selection was based on our personal preference. We have not offered a complete representation of all major Australian companies. A few, in fact, are conspicuous by their absence. The material was primarily chosen for its visual or verbal interest, and to a minor extent, for its historical relevance. In essence, if we liked it, or we liked what it reflected, it was included. Marks that contain obvious Australian symbolism, e.g. : nationalism, maps, flora, language, landmarks. 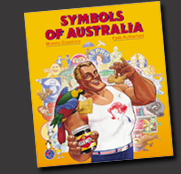 Marks for products that, although not containing any specific Australian symbolism, have become part of our consumer heritage, e.g. : Aspro, Arnott's, Vegemite, Minties, Aeroplane Jelly and Foster's Lager. Marks for unknown products or marks lacking in Australian symbolism but representing absurd, humorous or obscure thinking that was an integral part of the 'try anything once' attitude of a developing nation. Directly from packaging, posters and advertising or correspondence with companies and individuals. The Commonwealth Government Patents, Trademarks and Designs Office for applications of trademarks from 1906 to the present. The Australian Archives, Canberra, for colonial registers of trademarks prior to 1906. The earliest surviving records of registered trademarks are the individual colonial registers. Laws relating to the registration of trademarks were enacted in South Australia in 1863, Queensland and Tasmania in 1864, New South Wales in 1865, Victoria in 1876 and Western Australia in 1885. We therefore set the opening date of research at 1860. We found, however, very little, value or interest in any of the colonial registers before the 1880s. Even newspapers and journals from the same period had little to offer. The closing date of 1960 marked the introduction, to Australia, of a new wave graphic approach to trademarks. This date has been adhered to; the only exception being the inclusion of current marks which show a design progression. Our correspondence with Sidney Cooke Ltd revealed that this product was patented in 1892 and the trademark was used as early as 1895. The delay in applying for registration was probably due to Sidney Cooke's perceiving no need to register the mark as they felt the product was adequately protected by the patent. When the new Commonwealth Trademarks Register was introduced in 1906, the resultant publicity would have made them revise their thinking and apply for registration. Wherever possible we have verified dates supplied by individuals or companies, but inconsistencies may still arise. In such, cases we would appreciate readers' comments. The visuals at the foot of the text column are either contemporary, of special interest, or of a supportive nature. Australian commercial symbology is sadly overlooked, by most Australians. The Trademarks Office now accepts mere photostats as possibly the only surviving record of a trademark. Corporations shed their identities with increasing regularity, discarding them without record. And commercial artists continue to work without personal credit. As we have already stated, this book was written by the forgotten businessmen who commissioned the trademarks and the unknown artists who created them. It is our hope that after reading theirbook, individuals will be inspired to keep detailed corporate archives ensuring a comprehensive record of this revealing area of Australia's heritage.